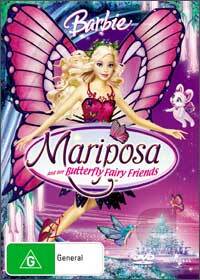 Girls of all ages can once again experience the timeless character of Barbie in "Barbie Mariposa" which has our childhood heroine visiting the wonderful and magically world of the Butterfly Fairies. When the beautiful butterfly fairy called Mariposa is called to rescue her Queen who has been poisoned by the evil fairy Henna, her adventure beyond the glimmering magical flower lights will have Henna and her friends journey into strange lands in order to find an ancient antidote. Although part of the "Barbie" brand, this DVD could be watched by children of all ages as it contains adventure, action and humour as the the world they know is about to transform into the wondrous world of fairies and other fairytale characters. With good video and audio quality, this is one DVD that Barbie fans will simply adore.